Negative Ads Reign In Maine Senate Race : It's All Politics The race for the state's open U.S. Senate seat has been dominated by three things: an independent former governor, third-party spending and a barrage of negative television ads. Among the casualties of the campaign have been the candidates' positions on the issues. Former Maine Gov. 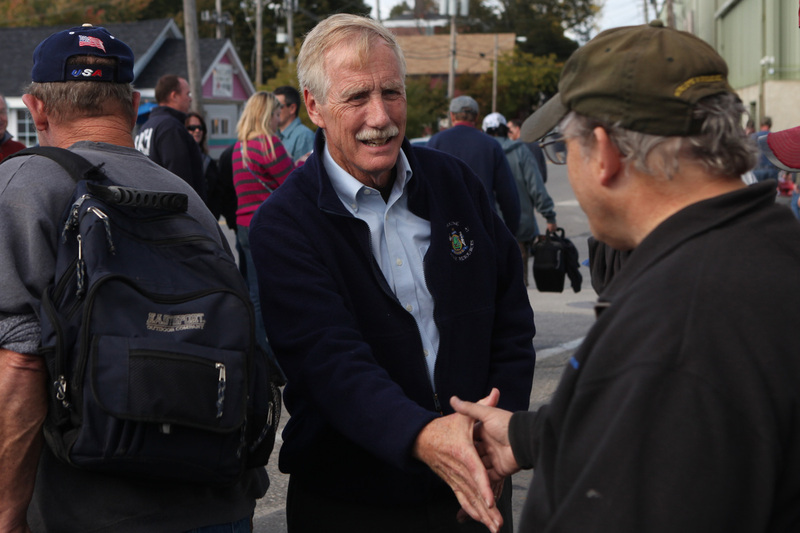 Angus King, an independent candidate for the U.S. Senate, greets potential voters Oct. 1 in Bath, Maine. Former Maine Gov. Angus King is convinced that if the math works out he could be the power broker in the U.S. Senate, the independent candidate whose vote will break the political gridlock in Washington. But first he has some explaining to do. Over the summer, the U.S. Chamber of Commerce began running an ad that attacked the former governor as "the king of spending" during his two terms in office. Another ad, sponsored by the National Republican Senatorial Committee, suggests King used improper channels to secure a federal loan for his windmill business. An independent fact-checker found the NRSC ad to be false. King has spent the past several weeks defending himself, threatening to file suit and looking to close the deal in a campaign solely focused on reducing his lead. Despite more than $2 million spent trying to defeat him, King is still well ahead of his opponents, Republican Charlie Summers and Democrat Cynthia Dill. "The Maine Senate race has been distinguished by the fact that you have relatively odd dynamics," says Anthony Corrado, a political science professor at Colby College in Maine. "There's been very little debate and discussion on the general issues and what these candidates would do if elected." He says what makes the race unusual is that Republicans have gone so far as to pay for a television ad supporting Democrat Dill in hopes of siphoning away votes from King. He says what's also surprising is what's been absent from the race. "There's been very little debate and discussion on the general issues and what these candidates would do if elected," he says. "King has not done any advertising that really presents the positive case for his election, and neither the Democrat[ic] nor Republican nominee have done any advertising to explain what it is they would do if elected." King has been criticized by both of his opponents for refusing to say which party he will caucus with if he wins election to the U.S. Senate. He's largely perceived as a Democrat who supports President Obama and the Affordable Care Act, and who's willing to raise taxes as well as cut spending. At the Fryeburg fairgrounds in Maine, it's clear that King remains popular with Maine voters even if they can't articulate where he stands. "I'm a fiscal conservative, and something has to happen," says Scott Ferguson, a third-generation Republican who is supporting King. When asked what issue it is that King stands for or against that resonates with him, Ferguson replies, "It's hard to say. I think the economy." When pressed for details about what King would do to improve the economy, Ferguson is unsure. But he says King is well-poised to build a centrist coalition that can get results. That's a view that's now being taken to the airwaves. Last week, the nonpartisan group American Elect announced that it will spend more than $1.5 million on the independent candidate's behalf, something that has King's opponents crying foul about the influence of out-of-state money and that once again distracts voters from key issues in the race.